I’m back in the saddle this semester with the growth of the SPICE (Special People in Catholic Education) program here at St. Laurence. As far as we know, our Catholic school is the first in the state of Texas to entertain private and small group education programs for students who struggle in the classroom. Our year started out with only two students. Then we grew to three at the beginning of January. Now, brace yourself… We now have a fourth student who will begin next week! The first three students were currently being served in our school with two periods a day of pull out instruction. This fourth student will be served on a full time basis in SPICE with an inclusion concentration in the areas of social skills at recess, lunch, electives, and religious activities. We never anticipated the growth of our program to expand so fast. We are also planning a luncheon to announce the SPICE program in all its glory to our local community. Our goals include informing the parish and community and soliciting donations from those corporations and families who find it in their hearts to give back to an educational program they feel so passionate about. Pioneering such a plan can be very lonely when there’s nobody to ask for advice. In times like these, we have to pray and ask God to give us the insight we need in order to serve his mission and serve his children. I’d love to hear from you. Have you found any Catholic or religious schools that serve special needs students to such specific capacity? Is your private school looking to serve students with moderate to severe academic needs? Let’s share and learn from each other. 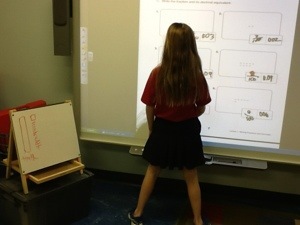 A student during a private math lesson on decimal modeling at the Smart Board.